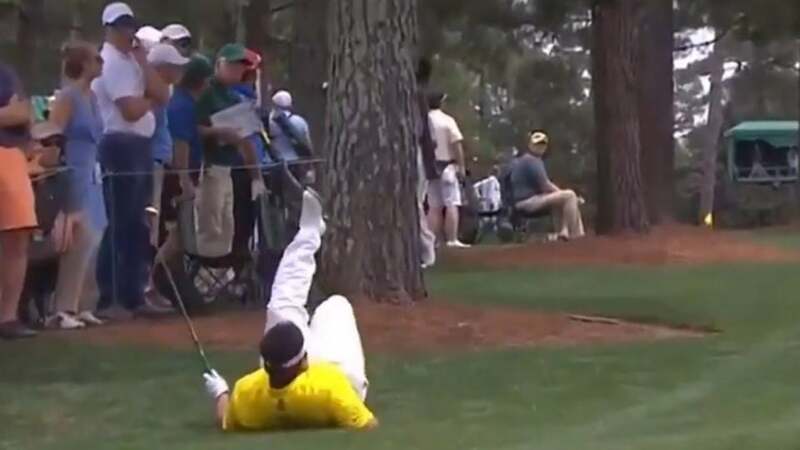 Kiradech Aphibarnrat falls down after hitting a recovery shot Friday at the 2019 Masters. If you’re over Phil’s frequent ups-and-downs, tired of Tiger‘s latest comeback, and unimpressed by titanic drives of DJ and Koepka, we have a new favorite golfer for you. His name is Kiradech Aphibarnrat, and he’s making moves and loads of new fans at the 2019 Masters. On Friday at the Masters, Thailand’s rising star earned applause, as well as laughs, when he toppled over to make a heroic recovery shot at Augusta National. At the par-4 17th hole, Aphibarnrat lost his drive to the left, where it finished in the second cut. With a stand of pines between him and the green, he needed to hook his approach out and around the branches to reach the putting surface. Aphibarnrat got set, and then took a mighty lash at his ball. The force of his hook-swing caused him to spin like a top and then topple onto the ground as his ball sailed away. It could have been an embarrassing moment, except the corkscrew shot worked like a charm. Incredibly, Aphibarnrat’s spinning ball not only found the green, it stopped hole-high, 19 feet away from the cup. Check it out below. From there, he made an easy two-putt for par. Aphibarnrat last year became the first Thai golfer to earn his PGA Tour card last year. He has collected four European Tour victories in his career, mostly recently last February at the ISPS Handa World Super 6 Perth, and has quickly become a folk hero in the golf world. He followed up his par at 17 with another on the closing hole, giving him an even-par 72 in the second round. Thanks to a stellar round on Thursday, he sits at three under, not far out of the lead.